Hey guys, I ran a marathon! And I went sub-4 (in the most dramatic style, 3:59:59). This past Sunday, October 7th, I got to join about 3100 other runners in the 32nd annual Lakefront Marathon in Milwaukee. 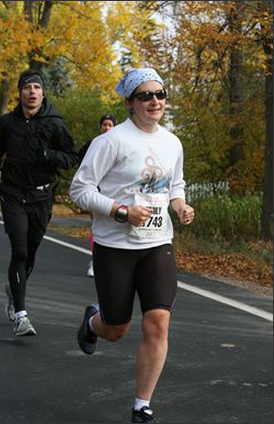 This was my third marathon (though my fifth race of 26.2 miles or more). But it almost didn’t happen. Take a look at this chart showing my running distances for the year. As you can see, in June and July, my mileage fell dramatically as I pulled up lame with (what I was told was) a strained (“torn”) quad. By the time I was getting back on my feet (early August), I had only about ten weeks to train (including taper). My PT suggested that I should consider doing a half instead of a full; a suggestion I immediately discounted because: 1. He’s not a runner and doesn’t really understand what is required to train for a half versus a full (to be honest, I’m not sure he believed me when I told him how much I ran), and 2. I was already signed up for Lakefront. Mid-August, I sat down and made up a training plan. Essentially, I run five days per week: Tuesday, Wednesday, Thursday, Saturday, and Sunday. I planned to run my normal mileage on Tuesday-Thursday (generally eight to eleven miles per day depending on whether B wants to run or not, including a speed workout on Thursday) and then to increase my Saturday long run, ultimately to a distance of eighteen miles, and do a shorter long run of ten to twelve miles on Sunday. This is essentially what I did (though I topped out at twenty instead of eighteen). I also ran a test half marathon at the end of August when I was in Salt Lake City, and I came in at 1:59:26. According to the McMillan Running predictor, this suggests a marathon time of 4:11:21. But do keep in mind I was running at altitude, which can slow you down by about fifteen seconds per mile (I got this figure from my brother; no idea if it’s true or not, but I’ll pretend because then it sounds impressive to have broken two hours). Before my injury, I was attending weekly track workouts. Of course, that had to stop, and once I was back to running, I started to worry that the workouts had caused or aggravated my injury, so I decided to hold off on returning until after the race. Instead, I did speedwork on my own on Thursday mornings. 1. Lupton 800s. These are my version of Yasso 800s, a workout typically done on a track that involves an 800 at speed x, then a cool-down for time (so if you run the 800 in 3:30, you get 3:30 to recover). Doing 10×800 is often felt to be useful in predicting marathon times-for example, if your average speed for the set was 3:30 per 800, you could probably expect to run your marathon in 3:30:00. My variations are based around not having a track readily accessible near my home, so I run my 800s on a mile-long, flattish stretch of road near my house. My cool-down, instead of being time-based, is distance-based–the other half of the 800 to get back to the “starting line” at the beginning of the mile stretch. I started with a set of seven and worked up to ten, slowly dropping the time I was aiming for. In the end, I was averaging about 3:54. 2. Dual Pace Runs. I read about this in one of the endless newsletters Active.com sends me, and it turned out to be pretty fun. Warm up for a mile at whatever pace you fancy (I usually do about a 10:50-11:30, because I’m running with the dog). Then alternate between your half marathon pace and your marathon pace, doing half a mile of each for eight miles. Then cool down for a mile. So since my half pace was about 8:50 and my MP about 9:10, I’d run half a mile at 8:50, then slow down and do half a mile at 9:10. I like this workout because the distance is short enough that it doesn’t feel overwhelming. This is also the longest workout I can do before leaving for work. I posted midway through last week that I was feeling less crazy than I usually do during my taper. This proved true until about Thursday, when stress and other worries combined to turn me into a pacing, bread devouring fiend. Well, maybe it wasn’t that bad. Anyway, the real issue started on Friday, when I woke up with a scratchy throat. I thought perhaps I had just been shouting too much during play practice, but on Saturday the feeling persisted. In addition, on Saturday for some reason I was achy. I don’t think I overdid it on Friday–my exercise level was normal or even reduced for me. This was troubling. By Sunday morning my throat didn’t just feel scratchy, but had worked its way to painful and swollen. As I hauled my body out of bed at 5:30, I offered it a deal: Get through to noon in one piece, and I’ll give you a long nap and some time off next week. I dressed in the silent house (we were staying at my in-laws) and grabbed a breakfast of two slices of toast with PB and bananas. Then I sat down and tried unsuccessfully to concentrate on my reading until it was time to go. Of course, we left a few minutes late, because that’s the kind of people we are, and then the highway between West Bend and Grafton was detoured and, and, and. B left me near the starting line with about 20 minutes to go (because of how drop off and pickup worked, we didn’t get any pre- or post-race photos, sadly). I immediately went into Grafton High School (i.e., the starting line) and started hunting for a bathroom with a line shorter than ten people. No luck, but I did manage to get through and get out to the actual starting line just as they started playing the Star Spangled Banner. It was an impressively bad rendition, and I spent most of it trying to get my watch to connect to the satellites. The speed work. If I’d done more intense sprints, I would have been faster, but for ten weeks I’m pretty satisfied. Nutrition plan. Three (decaf) gels and water at every aid station. The last-minute decision to adapt my pacing plan to how I was feeling. My shoes (Brooks PureGrit) were great and supportive and my socks (Balega) did not give me blister problems. Hurrah. Clothes. I dithered about this and eventually went with shorts and a long-sleeved shirt because of the cold. My legs were fine, but my hands were quite chilly at times, especially when we were hit by a headwind off the lake during the last three miles. Pre-race eating. I managed to go into the race a bit heavier than my normal racing weight, and also I ate a huge meal the night before and had to make two pit-stops. Should have taken a loperamide, I guess. Due to a misunderstanding, B met me at the art museum instead of at the finish line, so somehow wound up walking down four flights of stairs to get to where his car was. I would have preferred not to do that. The taper was relatively successful, I’ll admit. I wish I’d toned it down toward the end of week two and taken Friday completely off as well. That’s really about it. I’m quite satisfied with how it all went. The course was great, downhill (and with a tailwind most of the way), and the crowds were enthusiastic. I saw a couple of signs that said “Run, random stranger, run!” and one that said, “Go Emily!” While I was clearly not their Emily, they still held it up and cheered as I went past. Best of all, near mile 18, someone had set up a “Paul Ryan Finish Line.” The last time I ran a marathon, Obama was running for his first term and there were people in the crowd holding signs reading, “You can DO it.” (That marathon was in DC.) It was nice to see something along the same vein here, though with a more Wisconsin-appropriate twist. Now that I’ve done a couple of 50ks, it’s easy to forget how big a deal running a marathon is for almost everyone. I’ll admit it, this was kind of a big deal for me too. i’m so excited to do this run too! 2014! i’m doing it! great recap! It is a great run, and very flat/downhill, so a good course to get a great time on. The only potential bummer factor is that the weather in Wisconsin in the fall can be wildly variable. I didn’t do it this year, but I think it rained. Still, I’d do it again. 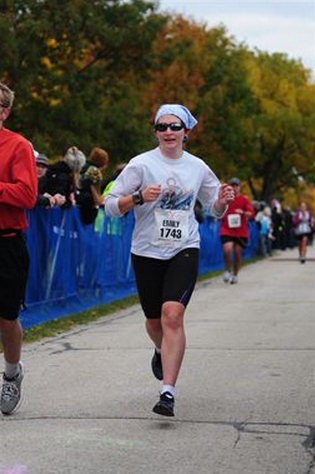 well… being a life long resident (except for 3 months when i was 21) of wisconsin i run year round outdoors. the only time i don’t run outdoors is when it is snowing coupled with gale force winds… then it is unbearable and i head for the dreadmill. otherwise i run in rain and snow. it’s really beautiful most of the time! i trail run a lot and really the trees block most of the evils of what most would consider bad weather. it is really fun to run trails in the rain! Good point. I run outside most of the time (try to avoid black ice days after I hurt my ankle on the ice last year), but I run mostly roads rather than trails. The one time I did a trail race and it rained, I was surprised by how much the trees helped shield us. oh yes! i have had my run in with black ice… just last winter. i am planning on getting some yaktraks this year. they’ve been recommended to me numerous times so i’m thinking they might be a good idea. Some of my running group really likes them. I often put small sheet metal screws in my shoes, but they still don’t get much purchase on ice. Maybe I’ll have to try Yak Traks myself.